Amelia Earhart, The Final Flight. Diane Keaton and Rutger Hauer. Diane Keaton plays the legendary aviator whose disappearance over the Pacific Ocean is one of the great unsolved mysteries of all time. 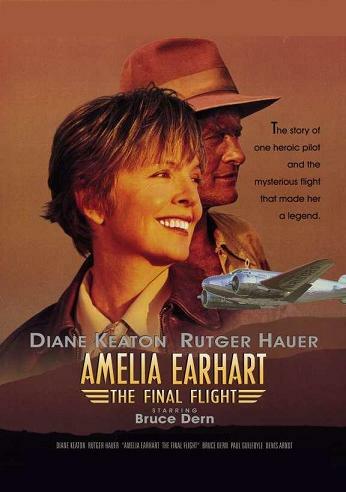 Earhart’s career, and her life goal to become the first person to circle the globe, is engineered by her publisher husband played by Bruce Dern. Their relationship suffers as an impatient Earhart puts up with his publicity schemes. Her relationship with her navigator, a once promising flyer who has become a burnt out alcoholic, played by Rutger Hauer is no less turbulent. Their incredible adventure finally begins. During the flight they encounter unreliable flight information, inclement weather, and a string of other foreboding situations. Witness the final moments of this ill fated flight. NOT to be confused with the more recent movie “Amelia” starring Hilary Swank.